M2 Tibbits are double-width modules occupying two "M" sockets on the standard tile. They are roughly 14 x 14 "squares" (one "square" is 2.54 x 2.54 mm). With double the size comes the doubled internal space and I/O capacity. 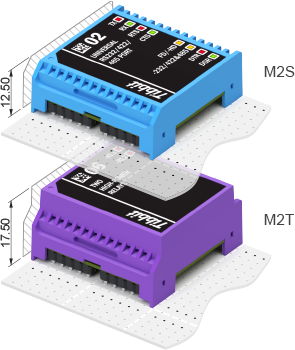 M2s have eight I/O lines. They are used for "grander things" that just wouldn't fit into the M1 form factor. 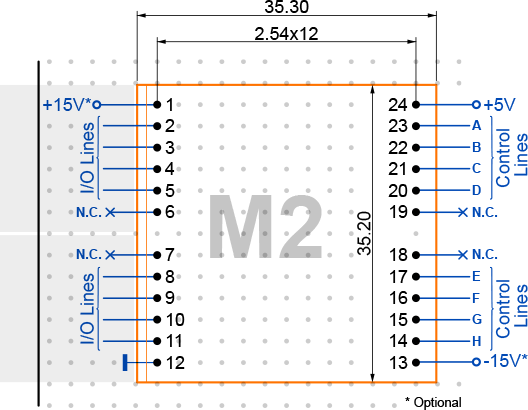 Like M1s, M2 devices can be short (M2S) or tall (M2T). M2 Tibbits can incorporate up to eight status LEDs. Pins 14-17 and 20-23 are control lines A-H. They are for interfacing to our embedded modules or other microcontrollers. On Tibbo Project PCBs these pins are connected to the main CPU. Pins 2-5 and 8-11 are I/O lines facing the outside world. On Tibbo Project PCBs they go to Tibbit connector sockets (i.e. connect to C1 and C2 devices). Pins 12 and 24 are the GROUND and +5V power pins. Most Tibbit Modules consume (take) 5V power. There are also power supply Tibbits that generate 5V power from a variety of sources. Those output 5V through pin 12. As an example of power Tibbits see Tibbits #10 and #23. Pins 1 and 13 are for the additional +15V and -15V voltages. These are optional and only needed by few Tibbits. A special power supply Tibbit #12 generates +/-15V from the main 5V power. Pins 6, 7, 18 and 19 are unused and should be left unconnected. Notice that each pin row has a "missing pin" in this middle. This separates a row into two groups of 6 pins.